the coordinates for the source model: ( 0,0,0 ), and which object it should be placed in relation to: Origin. Once youâ€™re finished press OK. 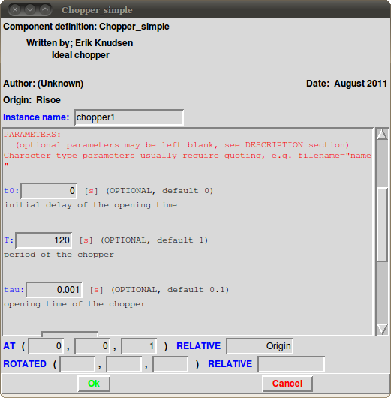 The GUI has now inserted the necessary code for the source model at the cursor. Note that we could just as easily have written this using a text-editor of choice (Emacs, gedit etc...) - McXtrace merely interprets the instrument file. 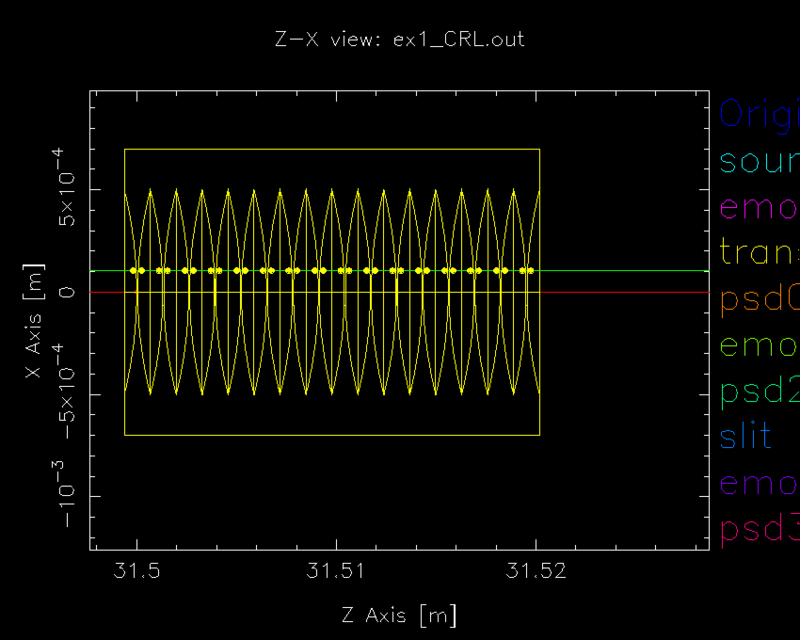 Optimize your simulation using directional sampling. 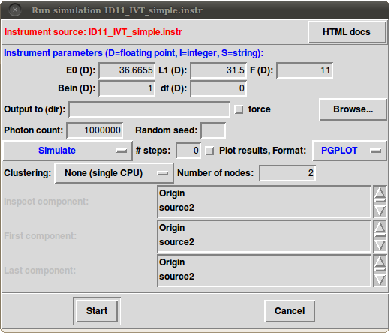 Add the parameters focus_xw=0.001, focus_yh=0.001, and dist=31.5 to your source parameters. This will cause McXtrace to only sample that part of the photon phase space which lies on trajectories that passing through a focus_xw â€…Ã—â€… focus_yh \si\metre\squared aperture dist \sim downstream from the source. The weights of the photons are reduced to avoid biasing - this way we get correct intensity measures inside the sampling window. 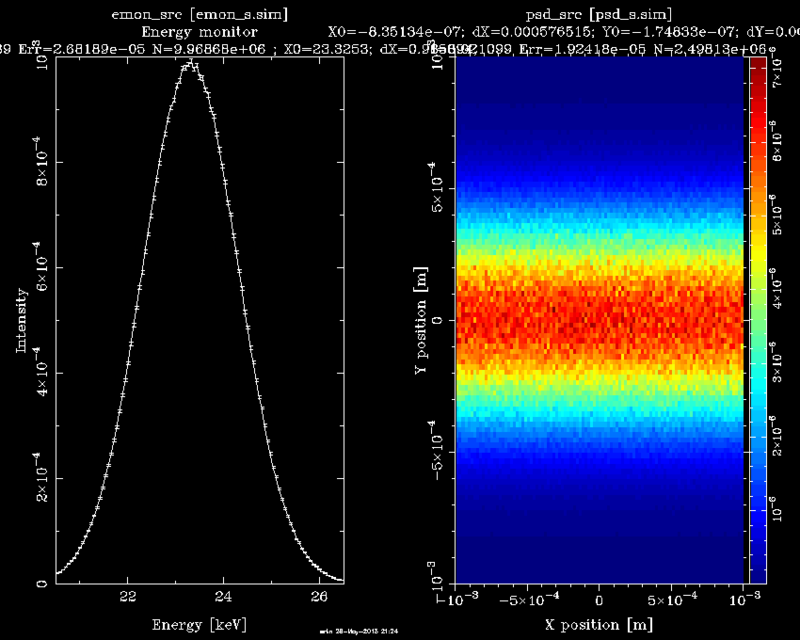 Use mxdisplay to try and visually track photons through the beamline model. 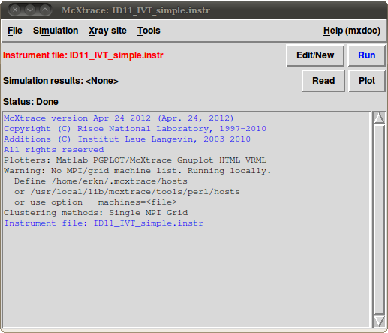 In the GUI this is done by selecting “Trace” instead of simulate in the run window. You will need to zoom in a lot to see the CRLs clearly. You should be able to saee something like figure 5â†“ below. How does the grouping affect the outcome? What happens if you donâ€™t use a GROUP? Looking back to section 1.6â†‘ - can you think of a GROUP-based way of switching between lens-stacks? Mirror_curved is by default set in the XY-plane. Think of how you can set your mirror to deflect the beam in the desired angle. Remember that for a mirror rotated Î¸degrees, the beam is redirected 2Î¸. Starting with a shadow simulation of a wiggler. Use the McXtrace to inject that into the McXtrace simulation from section1.6â†‘.